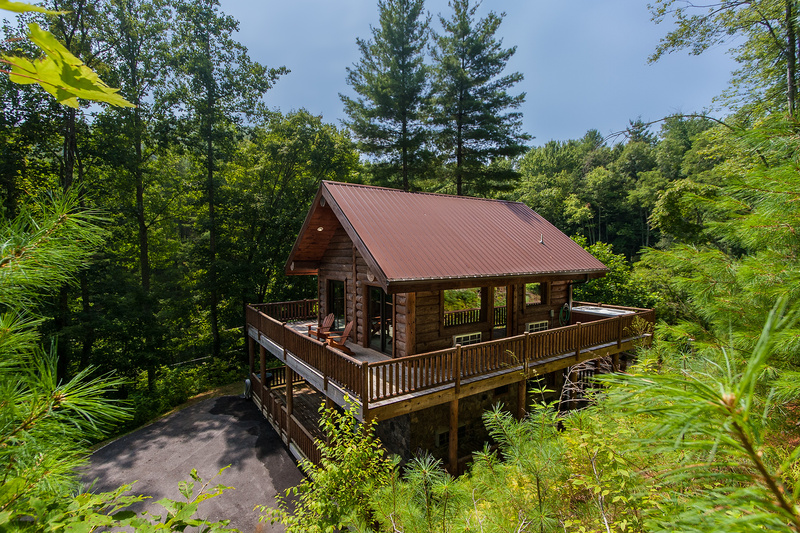 A Private Romantic Luxury Getaway 2 Story Log Cabin in the Fontana Lake area of North Carolina. 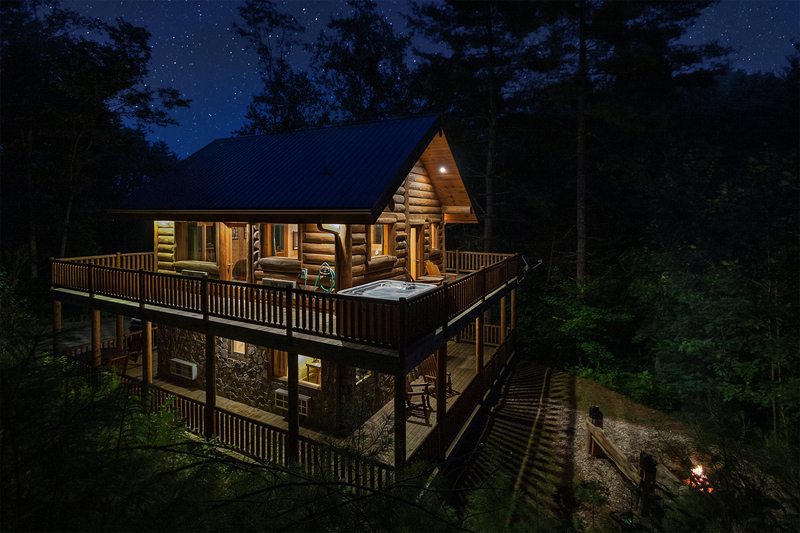 One bedroom romantic escape log cabin in a Smoky mountain forest. View of the smoky mountains from the upper front deck. 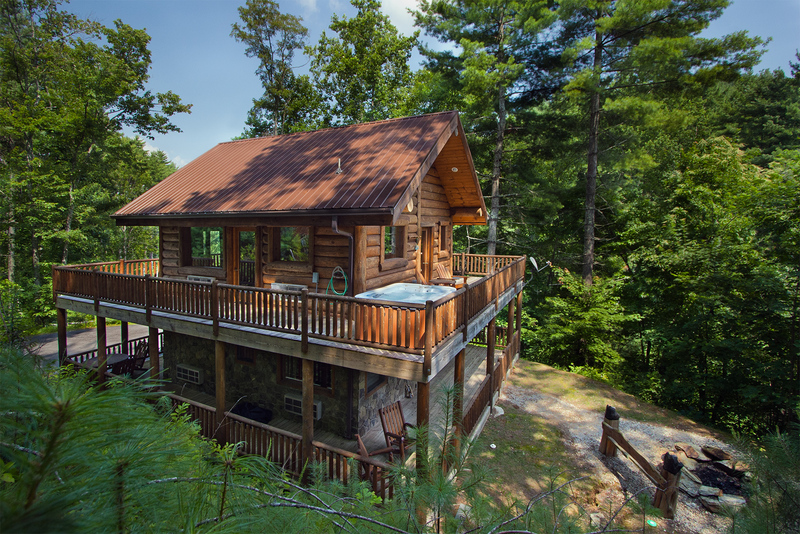 The smoky mountain forest surrounding the cabin wraps hot tub and deck in privacy. Paved road all the way to the front door. 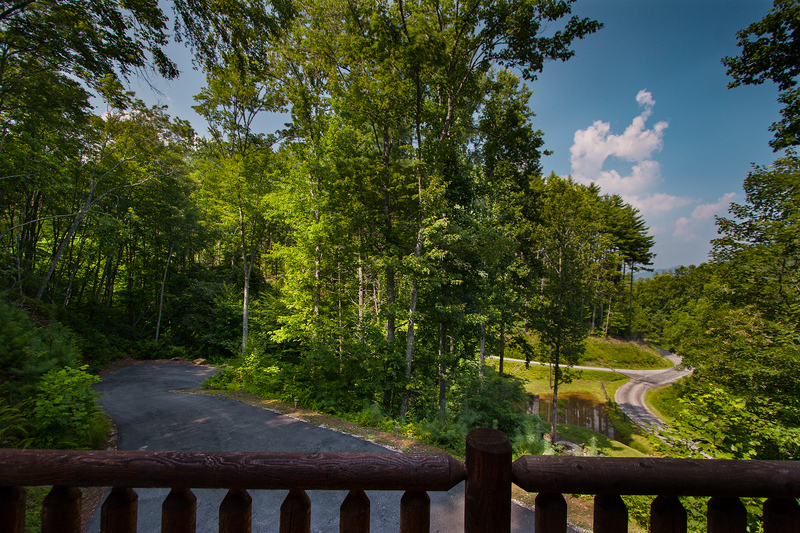 View of driveway and road to the cabin from the front deck. The back yard viewed from the wrap around deck on the upper level. Cuddle up on a bench next to a crackling fire in the back yard. 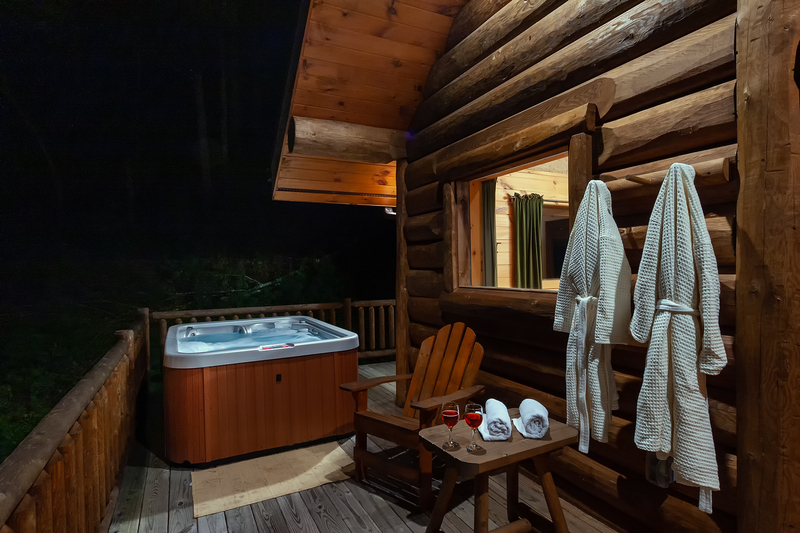 Warm glow of a private log cabin on a romantic evening. Cozy living room around a gas log fireplace and flat screen satellite TV. Full size kitchen with all cooking and dining utensils, even a dish washer. King size bed and satellite TV in the top floor master suite. Spacious master bath has large shower only and access to the hot tub. The gold fish pond below the cabin; how it got the name Black Bear Pond. Seating area and fire pit in front of the remains of an old cabins fireplace. Off Highway 28 just a few minutes from the Almond Boat dock on Fontana Lake or the Tsali recreation center,15 minutes from white water rafting on the Nantahala river, about 25 minutes from Bryson City and 35 minutes from Cherokee. 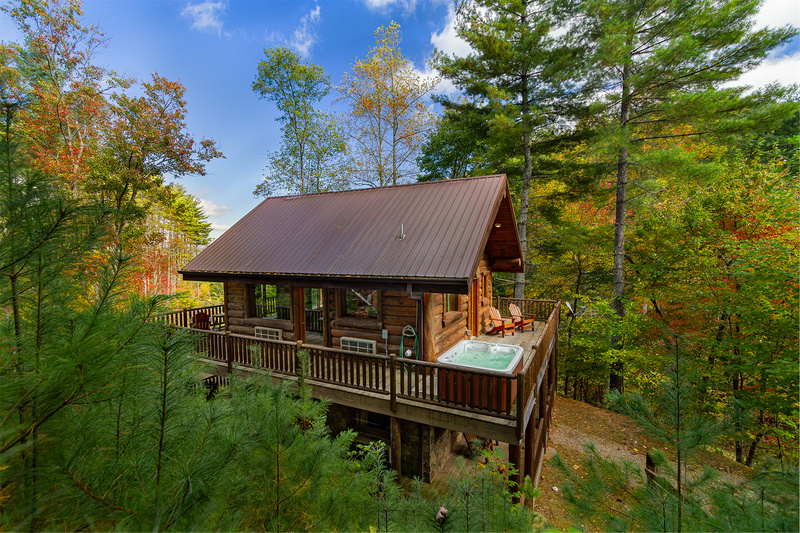 Black Bear Pond log cabin is located in a gated community with paved roads. The drive way to the cabin from the main road is paved. 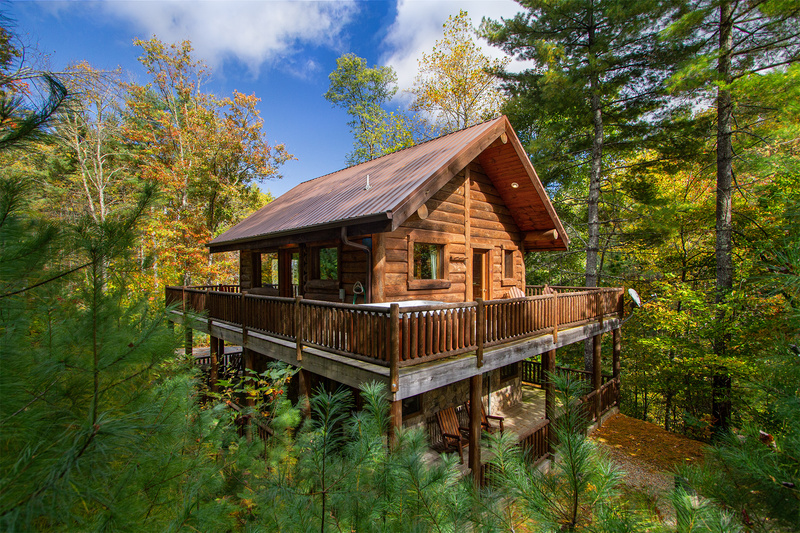 Black Bear Pond is a two story log cabin with both a lower and upper large wrap around decks. The lower deck is gated so most pets can experience the fresh mountain air with you. ( Never leave any pet unattended.) The lower deck is shaded, cool and scented by the trees surrounding the property. Around to the back of the cabin an other gate opens to a small back yard secluded by trees and the mountain side. 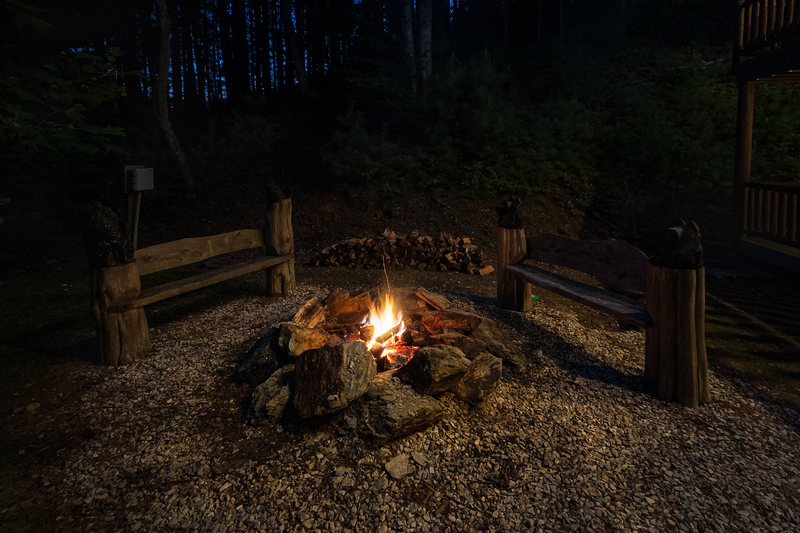 In the back yard evenings are made special by the glow of a fire in the large fire pit with custom hand carved benches. The upper deck is reached only from with in the cabin. The upper deck also wraps completely around the cabin. 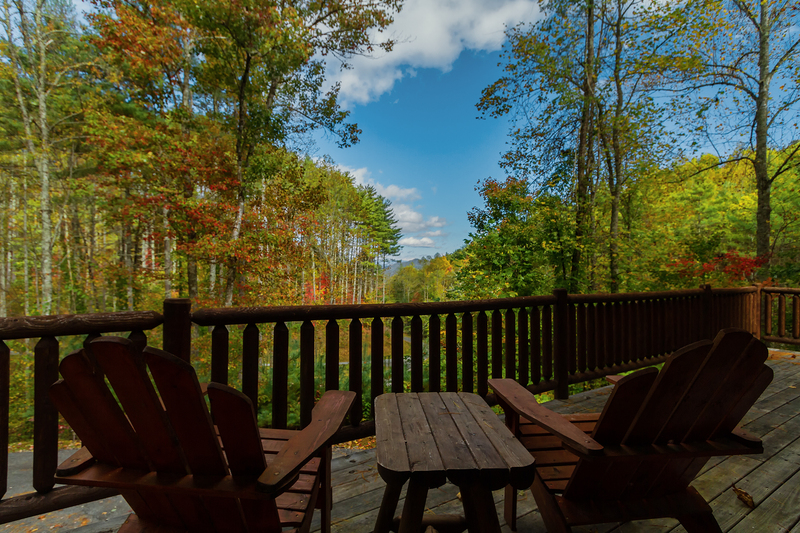 The back of the deck is also shielded from view by the trees surrounding the cabin. 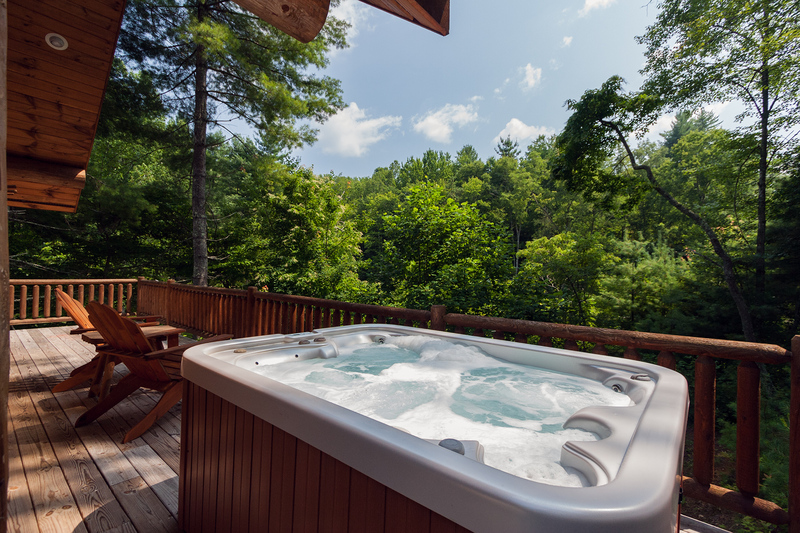 Here evenings become romantic when the stars fill the sky above the warm waters of a private hot tub. The front door slides open to enter into the dining area where the table is positioned to take advantage of views of the natural surroundings through the sliding door and windows. To the right is a full kitchen with all cooking and dining utensils needed to prepare a romantic dinner. Straight ahead past the dining area, stairs lead up to the upper level master suite. Past the stairs and to the right is a romantically cozy living room. The romantic ambiance is created by the combination of comfortable leather seating in front of a large stone gas log fireplace and warm natural colors of real wood walls. A flat screen satellite TV is above the fireplace and is perfect for cuddling in front of on a quiet night. A half bath is also accessed from the living room. At the top of the stairs from the lower level is the master suite level. To the right is the popular master bedroom with a comfortable king size bed and a flat screen TV mounted on the wall for finishing the movie you started in the living room. Sliding glass doors allow access to the wrap around deck and a great place to relax and listen to the native birds playing in the trees surrounding the cabin. The whole upper level has log beamed cathedral ceiling and large windows of natural light giving it a spacious feeling. To the left of the stairway is the large master bath. The shower in the master bath is large enough for two. The door in the bath leads out to the back side of the wrap around deck, giving easy private access to the out door hot tub.